Onwards And Downwards - baron m.
I propose a game that ever puts me in mind of my ill-fated expedition to recover for the glory of the Empress of Russia the priceless Amulet of Yendor from the very depths of Hell. With a band of eight Hussars at my side I established a foothold in realm of Limbum from which we struck forth into the Kingdom of Libidine. Alas, one of our number was overcome by desire when he chanced upon Helen of Troy and, as much as I reasoned with him, I was unable to make him see sense and continue the quest alongside us. We sneaked past the border guard of Gula as they lunched upon a tremendous feast at the sight of which our quartermaster, a corpulent fellow who had been complaining about the quality of our rations ever since we left Russia, determined to loot some provisions and that was the last that we saw of him! Alas, a similar fate was in store for our treasurer in the legendarily wealthy land of Cupiditas, but we soldiered on nevertheless. In Dis, the capital city of Irae, our company was further reduced when our Sergeant, an irascible fellow at the best of times, let his temper get the better of him and loudly declared, at some great length I might add, that the loss of our fellows made plain my unfitness for command. Naturally, honour compelled me to challenge him to a duel and, after I had inevitably bested him, I dismissed him from our number and compelled him to return to the surface. On the shore of Haeresis I was forced to do the same to an impudent private who dared suggest that the Empress was not worthy of the hardships that we had endured! Our progress through the land of Violentiam was hard fought, set upon by the inhabitants at seemingly every turn. So much so, in fact, that even my sword arm began to weary from exertion. Our youngest and least battle-hardened member fell to despairing that we should never achieve our goal and thence to his death, flinging himself from a cliff's edge shortly before we crossed the border into the province of Fraudis. We were met upon a bridge there by a soothsayer, who so convinced our remaining private of his impending death that he took to his heels and fled, leaving just myself and my deputy to complete our quest in the principality of Insidiæ. Side by side we fought our way into its heartland and when, after weeks of struggle, we finally found the Amulet the miserable scoundrel stole up on me from behind and knocked me out cold, making off with it for himself! That my return to the Empress's court empty-handed was an awkward one goes without saying! But I digress! Let me tell you the rules of the game! Commencing with a single rook upon the top left square of this here chess board I shall move it to the second file and then to a lower rank. You shall thereafter advance the rook beneath it by as many places as it was demoted but stopping if such a move should result in its being taken, in which case you shall have the game. 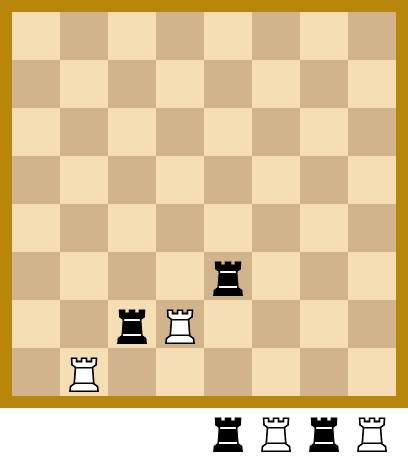 Should you not have taken the piece, you may advance either rook to the third file, provided that it is not of the lowest rank, and likewise move it to a lower rank, upon which I shall advance the rook beneath it to the same end. Play shall continue in this manner, with every rook upon the board eligible for selection, until either of us takes a piece or there are no unplayed files remaining. Should I take a piece from you then I shall have a coin from your purse; if not then you shall have a coin from mine. When I described my adventure to that bedevilled student whose company, for my sins, I am eternally damned to endure, he dared to suggest that it was no great curse compared to Quatermain's isolation within King Solomon's mines; as if that pipsqueak has ever ventured within a labyrinth more treacherous than a common library! But let us put that miserable homunculus out of our minds! Come take another glass and, if you hunger, another minced meat pie whilst you consider the wager!